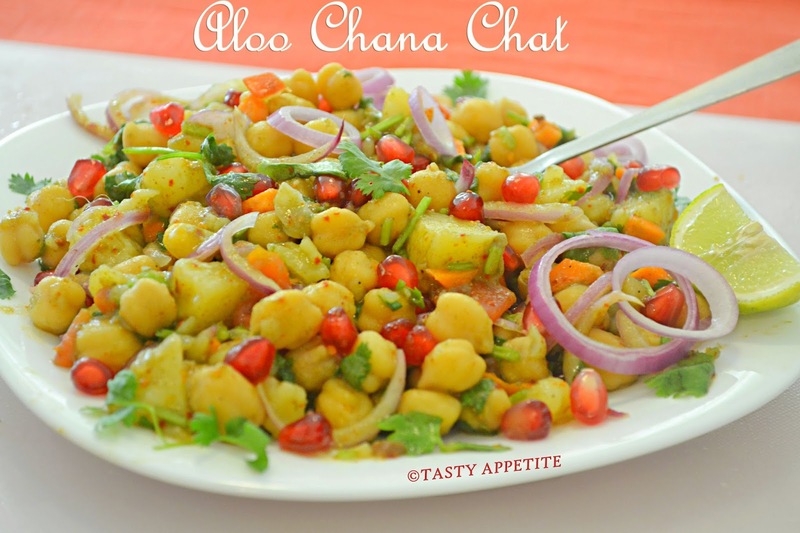 Aloo Chana Chaat is a spicy, tangy, chatpata snack, which is very easy to prepare, fresh and refreshing to eat. 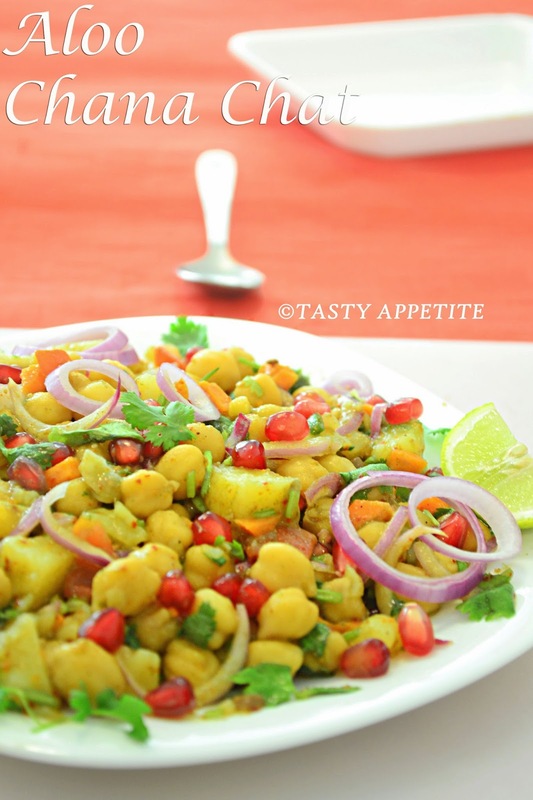 This awesome dish is very flavorful combined with a lipsmacking combo of boiled potato cubes, chickpeas, onions, tomato, coriander leaves and spiced up with chilly and pepper pwd. 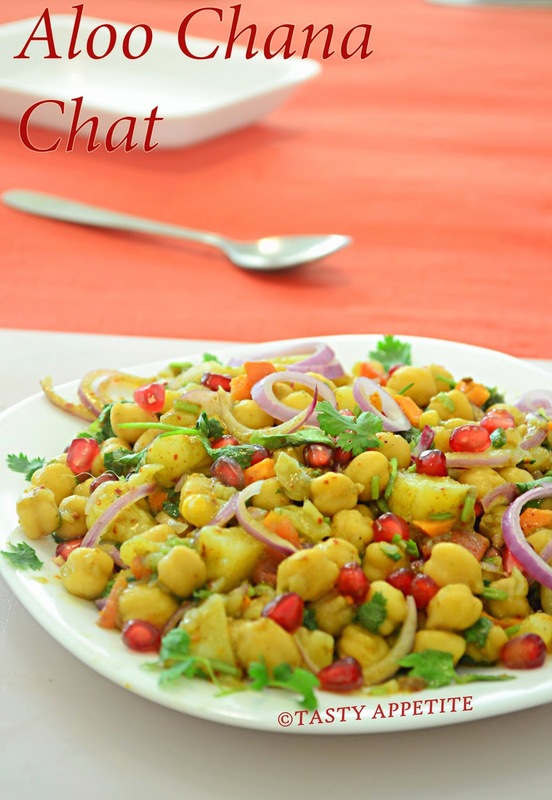 We can serve this chaat as a light meal or evening snack. 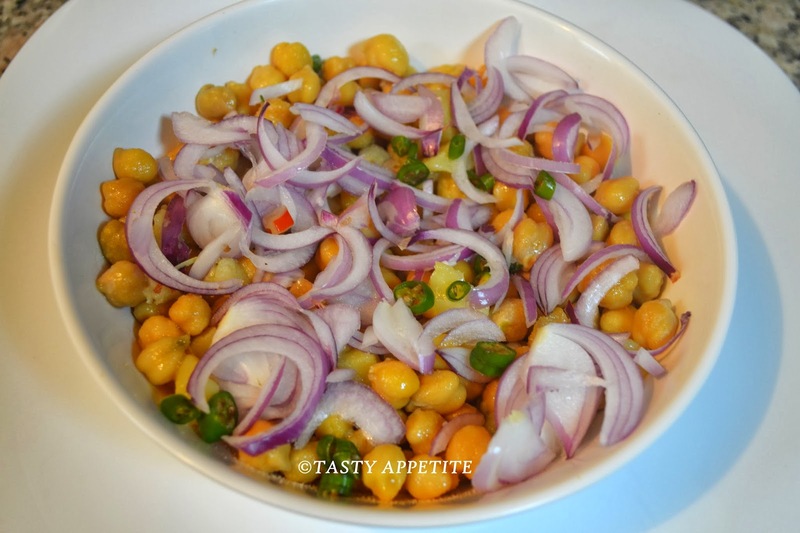 With this snack , we can get a good amount of dietary fibre, protein and other nutritions. 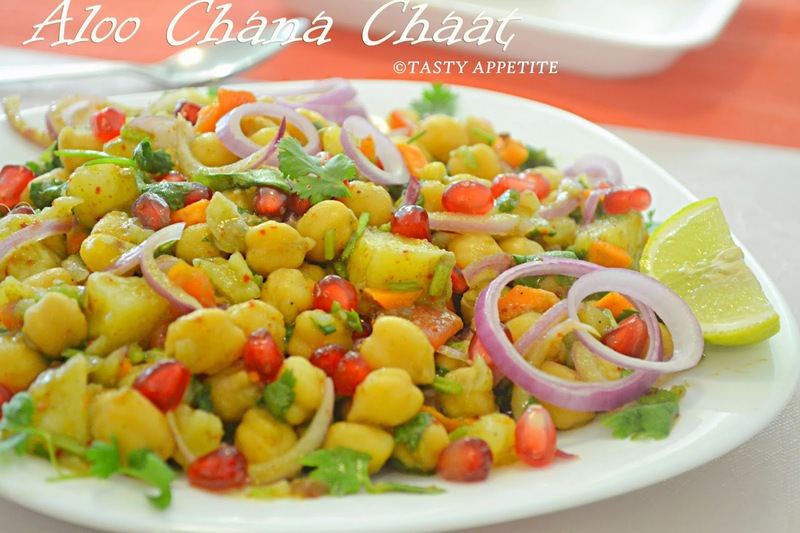 Here goes the easy, delicious and healthy Aloo Chana Chaat recipe..
1. 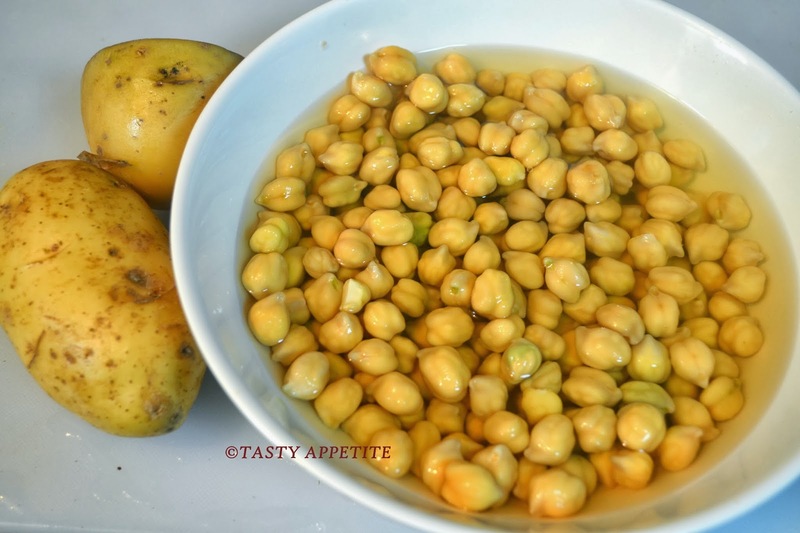 Wash and soak chana (garbanzo ) overnight. 2. 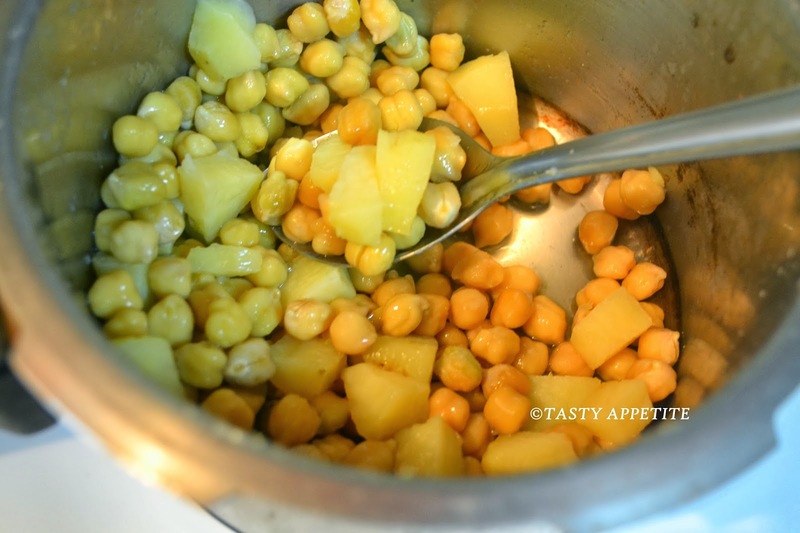 Wash and peel the potatoes and dice them to cubes. 3. 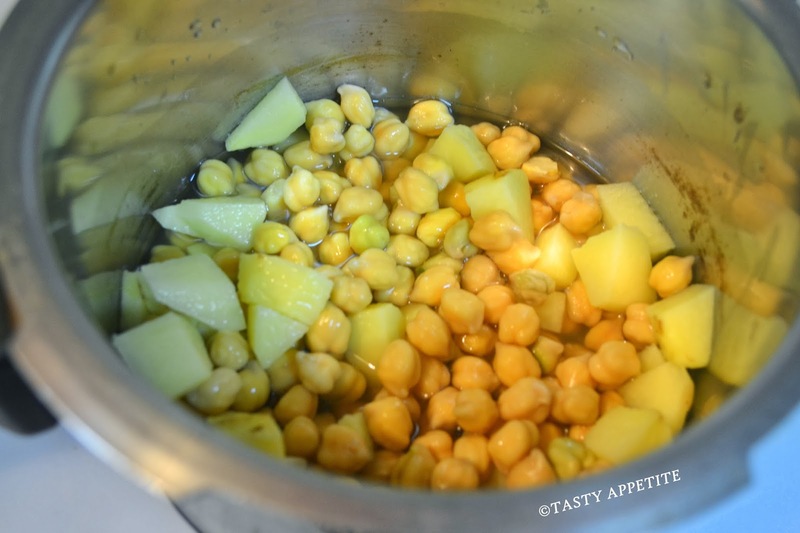 Pressure cook the potatoes and chickpeas till it turns soft. 5. 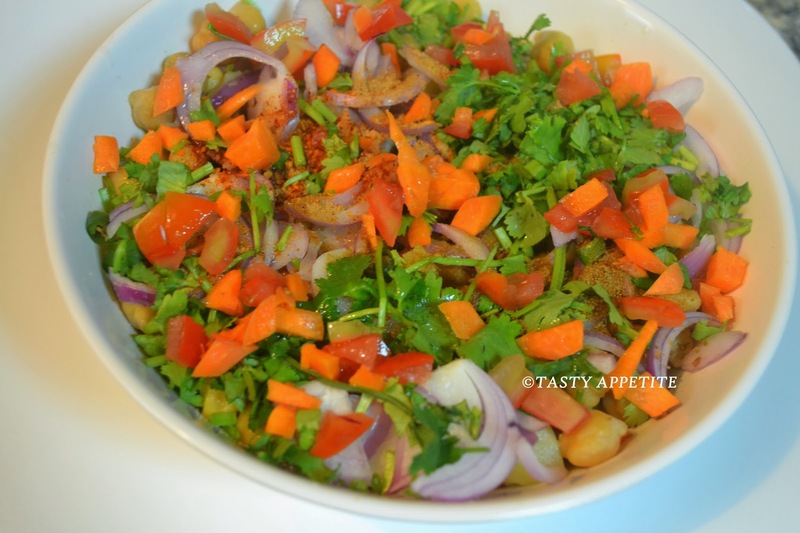 Chop finely onion, tomato, carrot, coriander leaves, mint leaves & green chilly. 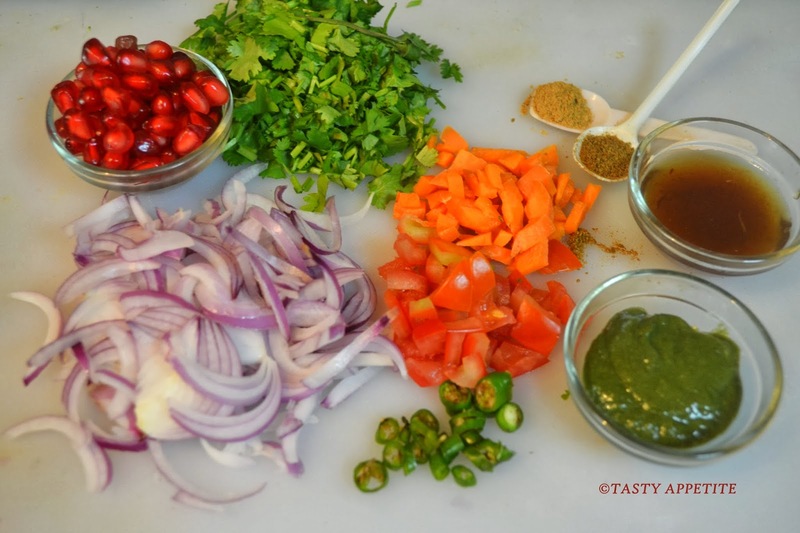 keep ready the sweet tamarind chutney, mint chutney, pomegranate, chat masala pwd and freshly ground cumin pwd. 7. 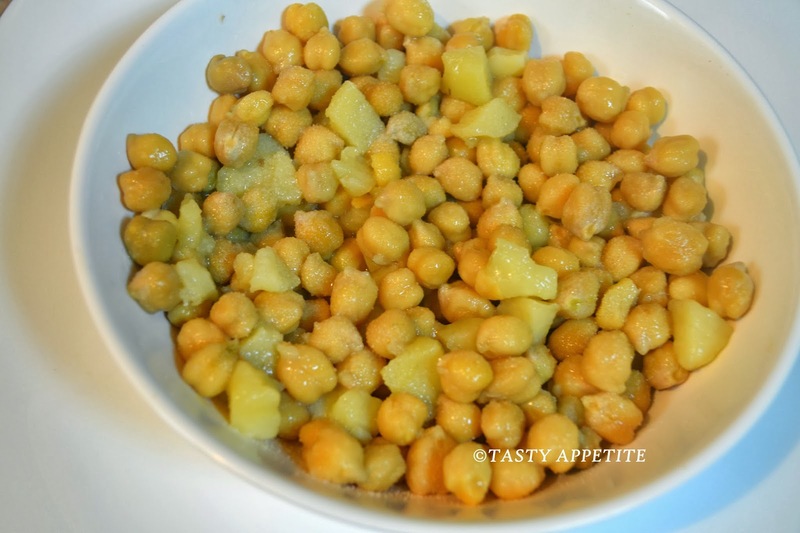 Add boiled potatoes and garbanzo. 9. 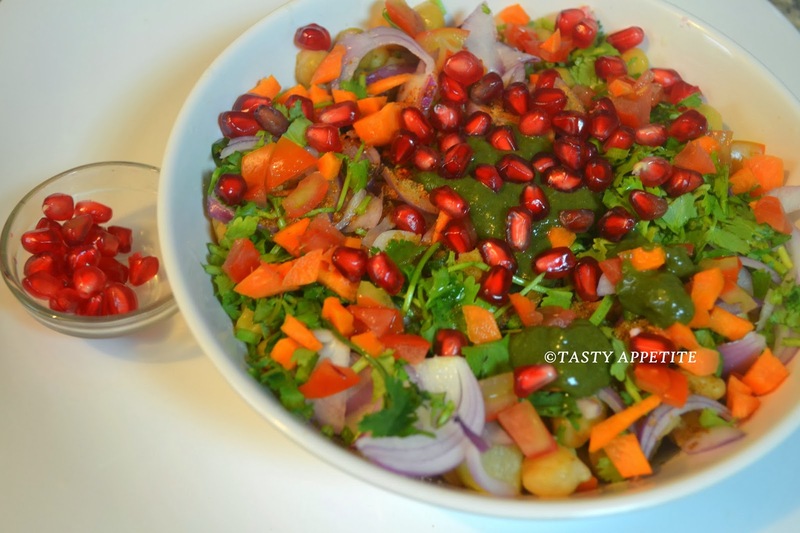 Add red chilly pwd, chat masala pwd and cumin pwd. 10. 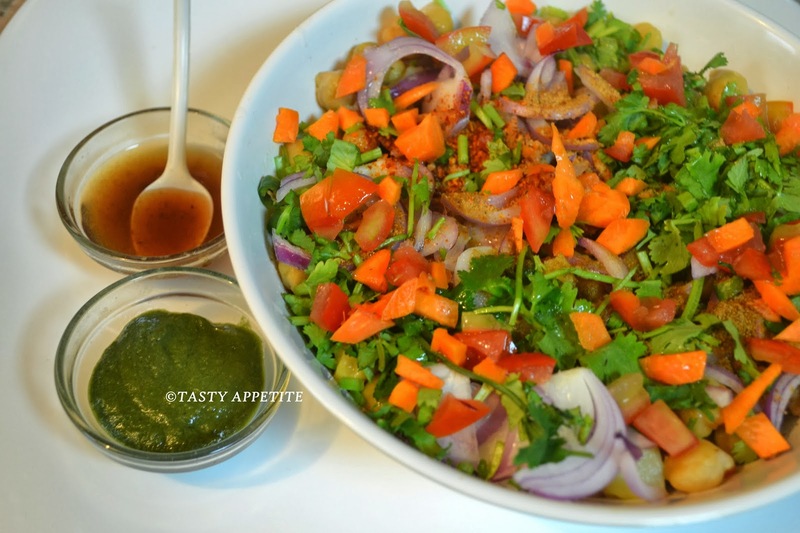 Add carrot, mint leaves, lime juice, salt and coriander leaves. 11. 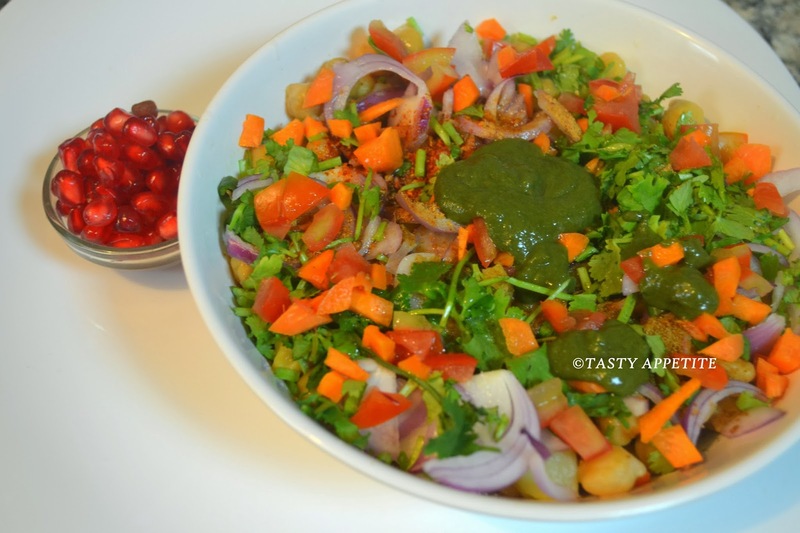 Add sweet tamarind chutney and green chutney. 12. 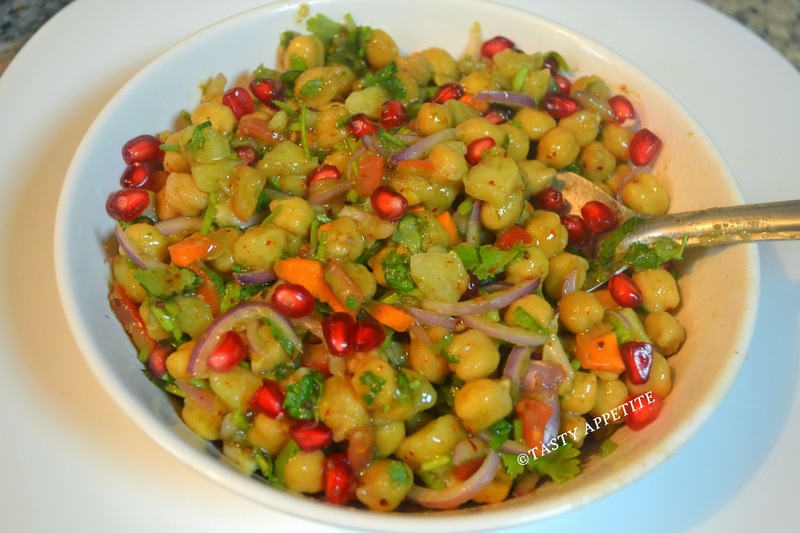 Now add the pomegranate seeds. 13. That's it...mix all together. 14. 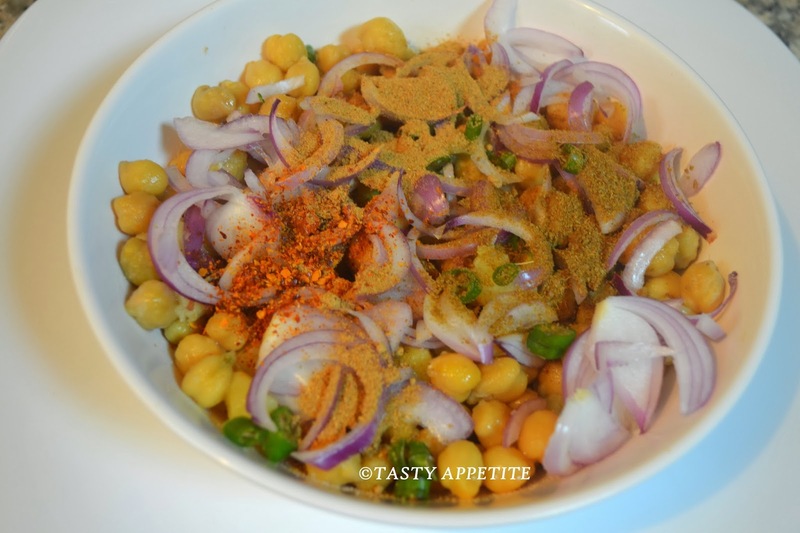 Tongue-tickling Aloo Chana Chat ready. 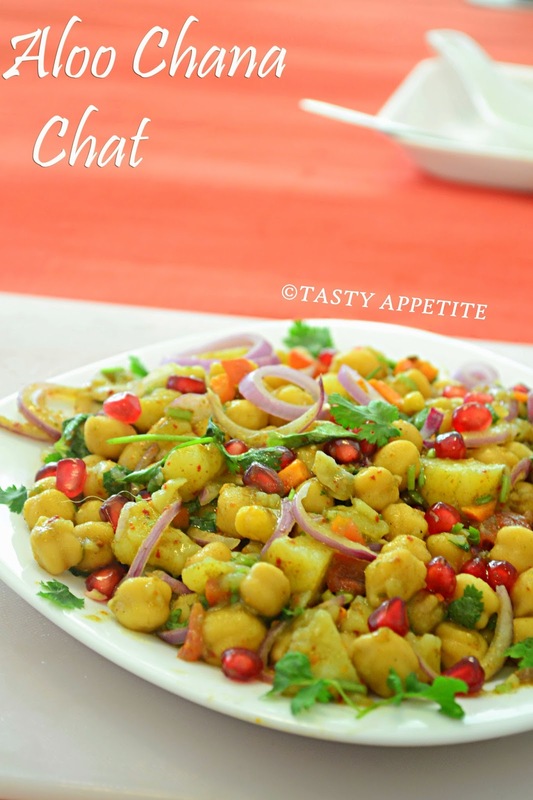 Enjoy the ever popular tangy snack of India..!